Image Below Or Add To Cart 1866 .22 Caliber/6mm crimps Double Barrel Blank Firing Derringer. Our 6mm blank firing Derringers feature a new design and this upgrade Black finish with Wood Grips. The barrels swing up for easy loading. The cam action allows the hammer to strike first one barrel then the other. This hide-away pistol was a favorite of many Gamblers, Ladies and Outlaws (sometimes one and the same). Great as Stage Prop Derringers, Reenactment Derringers, Display Derringers or just plain fun. Length 5”, Weight 0.8lb, Caliber 6MM - 6mm Blanks sometimes called crimps or acorm blanks - Rounds 2. 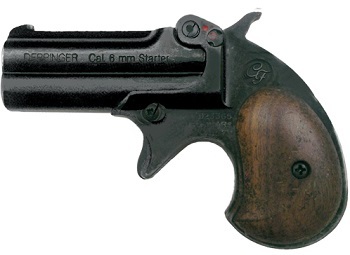 1866 .22 Caliber/6mm Double Barrel Blank Firing Derringer.